I offer workshops in making comics, and am willing to specialise in script-writing, pitching, publishing and distribution. Reductions for charities, non-profits and the unwaged. Group rate of more than ten may mean I have to charge more. I’m happiest with small numbers and willing to work on a one-to-one basis. Occasionally I’ll do someone a deal, so do ask. From NewsZoom to 24 Hour Comics, I’ve produced fabulous hi-speed comics. Trialling at Titancon 2012 and ComicsWest 2012, I’ll be encouraging participants to fly my tails in creating work this way. 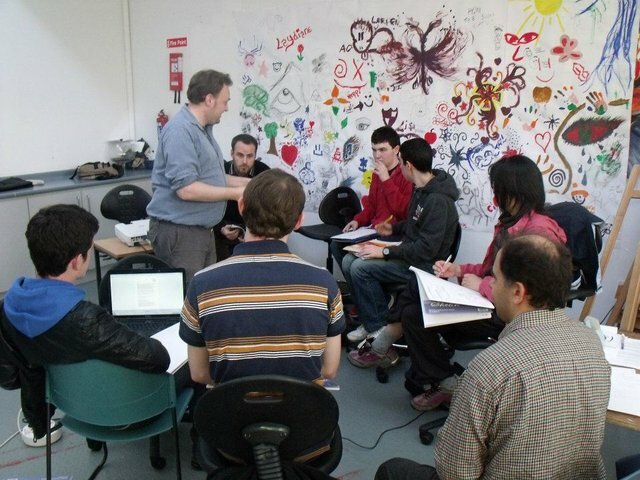 The session opens with a fifteen minute tutorial in making comics, followed by an hour in which every person (as a writer or artist), must contribute to one to two pages. This is followed by fifteen minutes on book-making and creator’s rights. I aim to produce a booklet from all the works within two hours of the factory session for use of attendees at the event. Costs include those of an extra creative factory supervisor for one hour at £20. I also require an additional £10 for book construction and a cost fee to cover copying and distribution. Only an estimate, a session with fifteen participants with fifty comics produced may cost about £65 in total, not including art tools. The Factory is best arranged early in the event, with sufficient tables and art materials. Participants grant their rights to a one-time only reproduction, although the event may consider selling comics for a charitable purpose. For breakdowns, email drew (dot) luke (at) gmail.com.